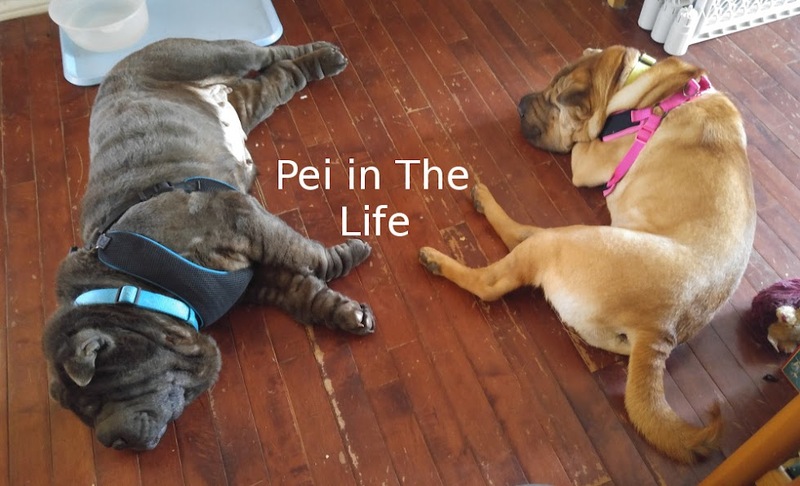 Pei In The Life: More Amazing Noseventures! So finally, we got to my Auntie Brenda and Uncle Bill's tent. I didn't even know they were going to be there! I didn't know they could TIME TRAVEL TOO! WOW! Flat Pappy was very interested in it. Yeah, not THAT is a guy that needs a BATH. Oh, and I saw this guy. He was even bigger than Mango and just as drooly. He'd fit right into our house. Puppy and I can drool up a storm. You can never go wrong with drool. Mom said no, because he wouldn't fit in the car. But he's a good looking guy isn't he? Once we Time Travelled ourselves back to the car, we stopped off at Grandma and Grandad's house. That was a nice place to drink down some water and rest a bit. I was exhausti-pei-ted! What a FANTASTIC Noseventure! I want to go back! Pei-Ess from Mom - For those interested, we were visiting Upper Canada Village in Morrisburg, Ontario. They hold a Medieval Fair in June and doggies are allowed in the village, provided they are kept on short leashes and do not enter the buildings. Please also be responsible and clean up after your pet. That was some noseventure you had, Bolo. I wish you could tell us how you time traveled because it would be fun to try. I'd want to be sure I could get back to the present, though. I wouldn't want to get left in a less dog-friendly era or anything. I'd be happy to take you up on borrowing your human puppy. Just pack him up and send him along, collect. I'll tell the Moms that we're paying for shipping! When do you need him back? Hi Bolo - WHAT on earth was that human doing??!! Crazy humans! And they complain about us doggies - huh! You're so lucky to get to go on such an interesting adventure - it's great that the fair allows doggies to go in too!